September 11, 2011 by Venky. When Minkey Chief landed in Bangalore with his Alanis (IRO Mark V), it was time to introduce the Bulldog to the beautiful Alanis. So, I messaged Minkey(Gautam) yesterday asking if he was ready for the ride to The Bull that he wanted to do. “Confirmed”, came the reply. We decided to meetup at 6am on Siva’s road and ride. When I got to Siva’s road at 6am, he was already waiting there. This was the first time I got to meet this gentle giant, ‘the chief of us simians’ as our friend Ullas calls him. When I saw Alanis, his beautiful IRO Mark V fixed gear and single speed bike, I was bowled over. What a beautifully setup bike it is! As we began to ride on Siva’s road it was abundantly clear what all the hill training in the couple of months preceding his India trip has done to the Chief, although it was only his second ride after landing here. He was ripping it on his 46×15 fixed gear setup as I struggled to keep up with him on my Bulldog. 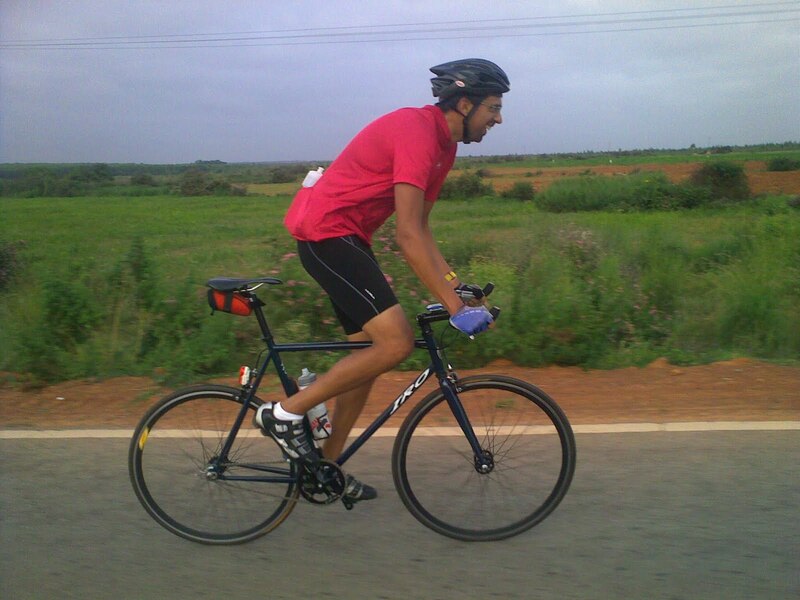 As we rode on on the Nandi approach road..
From the start of Siva’s road to the base was around 28.5 kmph which was very fast for me. At the base, Chief decided to flip the rear wheel to the freewheel side so that he could try the climb on a relatively forgiving gearing of 46×17. As we began to climb, I started a few seconds before him and began to ride. I didn’t want to and didn’t have the energy to give a hard effort on the climb. So, I kept going at an effort that won’t have me to blowing up midway through the climb. As I approached the steep section after 5km into the climb, I remembered how the teeth on the Bulldog’s cog broke off as I stood up and pedaled there. I shook my head and continued climbing seated. The first couple of bends of the steep section have always been a nemesis of sorts and how I did there usually determined if I could complete the climb non-stop. I fought off the mind’s suggestions to give up at these points and continued ahead. Once I got over that it was just a matter of going steady from one curve to the other until I see the curve 40 and the arch itself. I was expecting a time of around 38min which is a bit more than my PB of 37:37. But I was pleasantly surprised when I hit the lap button and saw 35:41. Not a bad day at the office, I guess. Satisfied, I waited at the arch for Gautam. I wanted to stay alert and capture the moments as he approached the arch and finished the climb. I kept looking down to see if he’s around the corner. After waiting for more than twenty minutes I thought something was wrong and began to descend. Deepak was just finishing his climb and I followed him back up for a short while. Got to know from him that Gautam was making his way down. So, we both coasted down and met the Chief there. Gautam and Deepak catching up at the base.. Apparently, Gautam climbed 5km and turned back saving the full Nandi darshan for another day. We had a nice time chatting there and while Gautam and Deepak ordered breakfast, I’ve decided to join the team spectrum guys Dr.Arvind, Rocket Gaurav and Ravi Ranjan on their last hill repeat drill. Rode with them for 3km and came down while they continued their 4km repeat. 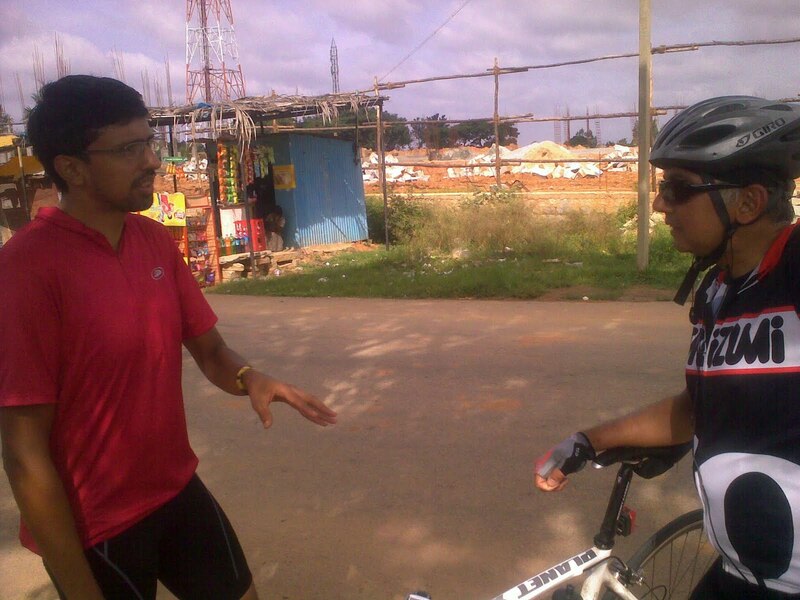 By the time I reached base, Deepak and Gautam were done with their breakfast and we began to ride back. 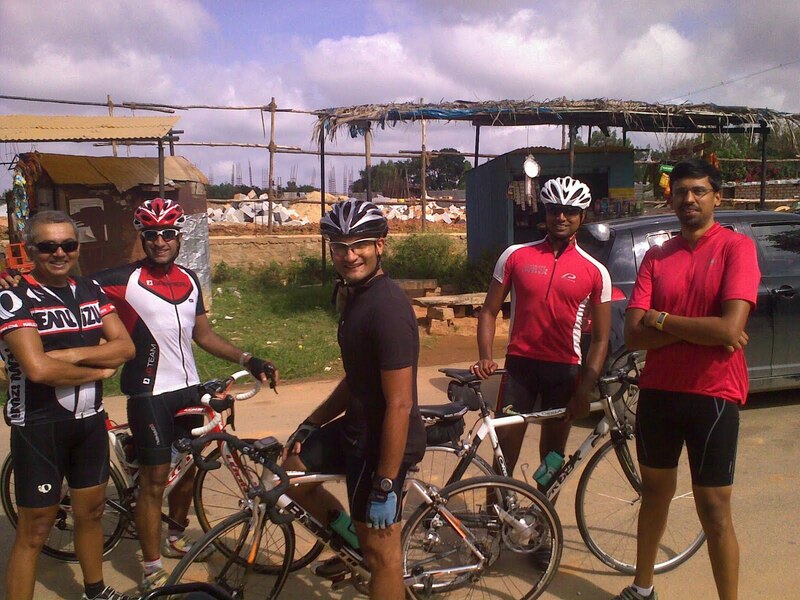 The two Docs, Rocket Gaurav, Ravi Ranjan and Mickey Chief at the base..
Deepak parted ways at the turn-off while the Chief and I went through Devanahalli and got on to Siva’s road. We rode hard for a while and I was again struggling to keep the Chief in sight. After crossing Budigere thankfully he slowed down to chat with me as we rode on. It was nice catching up with the man who I consider my guru as I’ve taken a few tips from him in the past on how to improve my writing. He writes for a living and is excellent at it. I always love his articles. 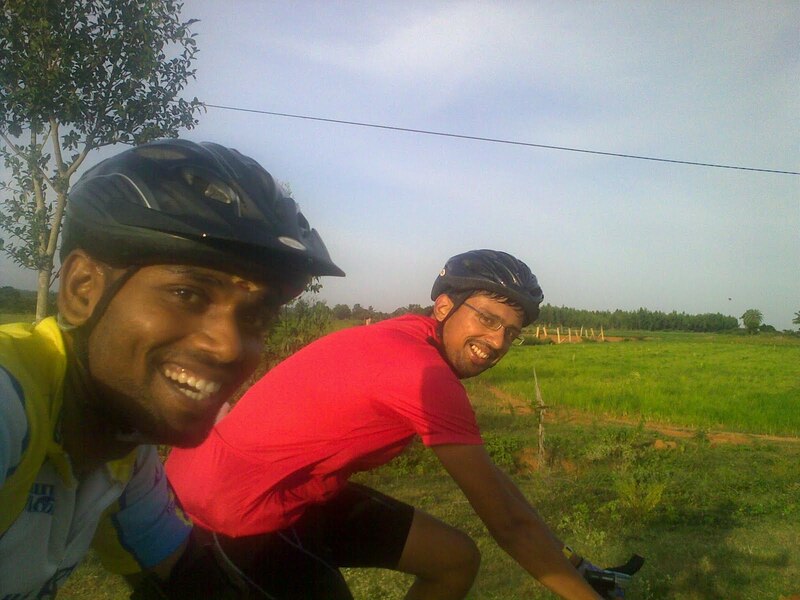 We parted ways from Siva’s road owing to ride together whenever we can before he goes back to his work and home in CA. It was a hard ride for me today but one which I immensely enjoyed.